These two meet in high school and reconnect a while later through a mutual friend gathering! Although many people thinks the fireworks were for the Fourth of July celebrations little did they know it was actually Laura and Wesley getting better acquainted that night! Fast-foward to fall of 2015. Welsey brought Laura on a camping trip to one of their parks; it was the same camping site in Lake City they had their very first camping trip! Wesley decidied that they needed to enjoy a walk, so off they went. Enjoying their walk they ended up in the same spot that welsey told Laura he loved her; in this same spot Wesley asked Laura to be his wife ! 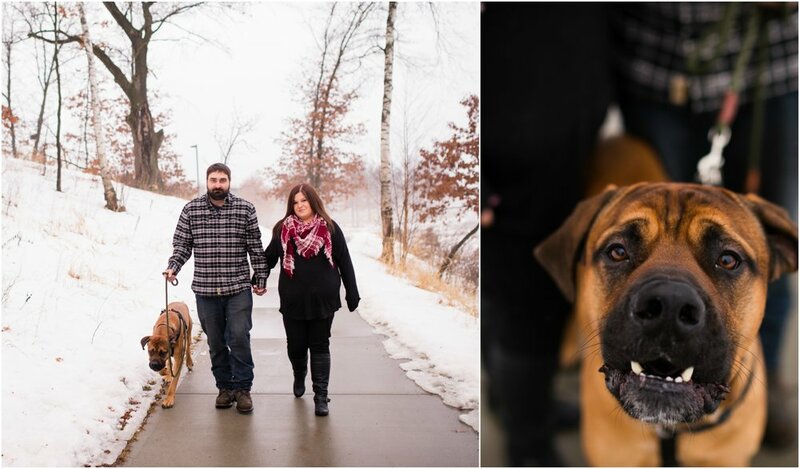 To date one of laura and Wesleys favorite adventures was welcoming their fur baby Thor, a mastiff, into their family! As we started to shoot the engagement session, Thor was pretty excited to be out and about, but we were able to get a couple of nice one of him in! We enjoy shoot their engagement session at Lebanon Hills Park in Eagan. Although the weather had been warming up we still had a chance go get a couple of photos on the lake!